Several representatives from the BFE will be on hand at the upcoming ISNR Conference - September 14-18, 2011 in Phoenix, AZ. Among them will be Francois Dupont, Ph.D.
At the Thought Technology Ltd.
Dr. François Dupont is a registered psychologist with competence in general, health, and rehabilitation psychology. In his private practice in Ottawa, he often combines bio/neurofeedback with techniques borrowed from cognitive-behavioural, dynamic-humanistic and experiential approaches. Involved with the BFE for more than a decade, he has developed software suites such as: Infiniti for The Learning Curve (TLC), Integrated Neurofeedback, and Monastra-Lubar Theta/Beta Assessment. His expertise as a clinician combined with his software knowledge make Francois an ideal contributor to BFE Software Suites. I recently had a chance to speak to Francois about a number of neurofeedback software suites he has created. This post about Integrated Neurofeedback is the second in a 3-part series. You have also created the Integrated Neurofeedback suite. It differs from other BFE suites in that it is not just about one specific topic. How can the Integrated Neurofeedback suite help both the beginner and the experienced neurofeedback practitioner? While beginners will benefit right away from the simplicity of this suite, experienced clinicians will learn to appreciate the many levels of integration within the suite itself and the integration with other suites from the BFE and from Thought Technology. Let’s explore the simplicity first. Even though there are many screens in the suite, the majority of the screens use the same template consisting of one main bargraph and 2 or 3 smaller bargraphs as watchdogs for artefacts and muscle activity. I’ve heard you refer to this as the “One Main Bargraph” approach. Yes. The main bargraph represents the result of a computation or an algorithm that can be very simple, like one frequency band inhibit from one physical channel. It can also be very complex, like combining 6 bands from 2 physical channels. For example, this could be 2 inhibit bands and 1 reward band per channel. The result of the computation, as sophisticated as it may be, is presented by that one main bargraph. This makes it very easy for the therapist and for the person who’s training to know what is supposed to happen; in most cases the goal is to lower the main bargraph. This “one main bargraph” approach also allowed for the creation of very useful and easy to read trend instruments that are integrated into the training screen. The therapist and the clients themselves can use these instruments to gauge progress in real time during the training session. Essentially, if the slope in the trend instrument is going down, you’re doing a good job because it means you’re progressing toward the state defined by the algorithm. How are the training bands determined? The Integrated Neurofeedback suite uses the specific training bands defined by an assessment done with a full QEEG, the TLC suite, any type of Mini Q assessments well as a symptom based assessment such as the Brownback-Mason CNC-1020. The suite uses these bands to automatically create a number of training screens that are customized to the client’s needs. Let’s say that the results from an assessment indicate that a client should decrease amplitude of lower frequencies (3 to 9 Hz) at C3 and C4 locations and also decrease amplitude of higher frequencies (21 to 35 Hz) at the same locations. And, it also indicates that an increase in amplitude of frequency bands 15 to 19 Hz at C3 and 12 to 14 Hz at C4 would be beneficial. You simply enter these band parameters in what is called the “Basic Planning Screen” to automatically generate a number of training screens with the specific bands for this client. Here are only a few examples of the screens hierarchy created in the suite. In these examples, when I talk of focus, I mean the computation or algorithm attached to the main bargraph in the training screen. Each one of these algorithms is computed in the background and the result is attached to the main bargraph. Training screens with ratios made of low frequencies over reward bands and high frequencies over reward bands are automatically created. Training for the percentage of the total power of a user defined band is also included. Training with Joint Time-Frequency Analysis (JTFA) is possible, as well as coherence training, Alpha-Theta training, reversal correction training, etc. Can you give an example of a typical session? This “one main bargraph” approach opened the door to a sophisticated integration of amplitude training and time in the target zone training, presented in meaningful audio and video format to create a multi-dimensional feedback system. In each screen the same computation is associated with the main bargraph and with a line graph. However, the resulting value is presented with different smoothing, which means that these two instruments move at different speeds. First, there is a musical key being played over a set number of octaves which is controlled by the line graph. The movement of the musical notes is threshold independent, there is no threshold, and is proportional to how far the line goes toward the condition to be reinforced. It is the foundation for training with eyes closed since this is a continuous and proportional audio feedback. This first level of feedback gives the following message: “You’re going in the good direction”. As soon as you cross the threshold on the bar graph, without inhibit or artefact, you get a very soft sound and the bar turns grey. The message here is: “You are able to reach the desired state”. Then, when you hold the bar in condition, without inhibit or artefact, for one unit of time on a counter, the animation moves and you have a soft pink noise, which remains present for as long as the bar is in condition. By adding the animation and a third layer of enveloping sounds, this level adds the following message: “You are able to sustain the desired state”. Finally, when you are able to hold the bar in condition, without inhibit or artefact, for a longer period of time, the default being 4 units of time, you have a discrete sound from a bell, as well as a green light and one point on the cumulative counter. Here the final message is: “You are able to sustain the desired state long enough to accumulate points”. The enveloping effect of this multi-layered feedback system has to be witnessed to be fully appreciated. What types of review screens are available? Another feature that experienced clinicians really appreciate is the Protocol Selector series of review screens. This is a type of review screen that is used right after a recording. What is different about this review screen is that it will plot the value of the actual computation used for training and associated to the main bargraph. For example, it will plot the sum value of “the low and high inhibits at C3 and C4” to quickly and easily show if the trainee is making progress with the actual computation. But what is really innovative is the fact that the other computations available in the suite are also on the review screen even if they were not used for the training session just completed. This allows verifying visually if another computation might be giving more efficient feedback than the one used during the recording. In our example, if a ratio made of the inhibit bands over the reward bands has a more pronounced slope than the algorithm using the sum of the inhibit bands alone, and used during the training being reviewed, it would be wise to test this protocol during the next training section. Finally, these Protocol Selectors and the other types of review screens, as well as the screens for statistics in the Integrated Neurofeedback suite can be used with data from most of the other suites from the BFE and Thought Technology. This is possible because special channel sets have been created specifically for that purpose. Once you have learned to appreciate the Protocol Selectors, you will be curious to see the data from other suites analyzed through them. We hope you will stop by to meet Francois Dupont and learn more about the neurofeedback education offered in our Learn From the Best program. Not attending ISNR but want to learn more? We offer software, interactive online learning and home study programs. The Integrated Neurofeedback software suite is available for direct download in the BFE Online Shop. Learning to use a new software program can be both time consuming and challenging. Join us in an online class to learn the basics and beyond in a friendly, interactive environment. I recently had a chance to speak to Francois about a number of neurofeedback software suites he has created. This post about Infiniti for The Learning Curve is the first in a 3-part series. The first suite you created with the BFE is called Infiniti for The Learning Curve. It allows the Infiniti user to interface with Peter Van Deusen's TLC database. How did this come about? 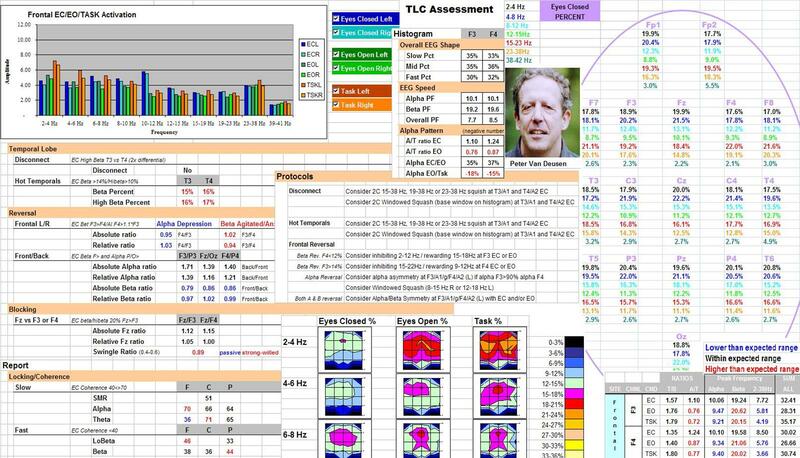 Peter Van Deusen’s TLC assessment can be used with different hardware and software platforms, but for some time there was no link with the BioGraph Infiniti system. Since that is the equipment I’ve been using for a number of years, I offered to create the interface and that is how I came to create my first suite for the Biofeedback Foundation of Europe. How is this suite beneficial to Infiniti users? The Infiniti for The Learning Curve suite is especially beneficial to Biograph Infiniti users who want, for diverse reasons, to use an advanced EEG assessment without going for a formal 19 channel QEEG. 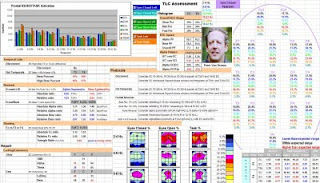 The TLC approach uses regular encoders like ProComp Infiniti, ProComp2, Procomp 5, and even the older ProComp Plus to record a structured and thorough assessment of brain wave activity. This can be done with two channels, 4 channels or 6 channels of EEG, with or without physiology measures, depending on the encoder. How does this assessment work? One advantage that Biograph Infiniti has over other software is the ability to use a scripted session in which all the steps in the assessment are already programmed. The user simply reads the instructions on the screen and clicks a button to advance through the steps. You begin by recording with eyes closed, then with eyes open and then with a specific task such as reading. This sequence of steps is repeated the number of times necessary to end up with 18 sites of recording. For each sequence, the sensors are placed in different locations on the head and the task is different. Because it is a script, it’s as if someone is taking you by the hand and guiding you through the process. How is the data interpreted? When you’re finished with the recordings, you can easily transfer the data into a very sophisticated Excel workbook, which is the core of Peter Van Deusen’s approach. In this file system you find different ways of presenting and analysing the EEG data recorded during the assessment. There are many maps, tables, graphs, and guidelines to help you make sense of the data. Everything is structured to help you decide where to put the sensors for training and which frequency bands you should train first. Are there other benefits to using the TLC approach? One obvious benefit of this approach is the price. A full QEEG system (hardware and software) is very expensive. With the TLC approach, you use the same encoder to do the assessment that you use to provide neurofeedback training. Many professionals serious about working in this field refer to the TLC assessment as being the next best thing to a full QEEG. Dr. Dupont's Infiniti for the Learning Curve software suite is available for direct download from the BFE Online Shop. Learn how to use the Infiniti for the Learning Curve software in a live interactive format. The Biofeedback Foundation of Europe provides education for experienced clinicians and researchers as well as for those just entering the field. Visit the BFE Online Shop to learn more. A key component in stress reduction and wellness is the use of proper breathing techniques. EZ-Air Plus is a software program that helps the user learn to pace their breathing for optimal health. 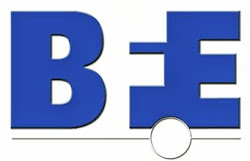 A free trial is available at www.bfe.org.